Far too many guys have fond memories of woodworking from their school days, but never get back into it. One of the major things holding a lot of people back is the sight of huge, professional workshops which some people have in their homes, and the thought that they’ll never be able to afford something like this. While there’s no cap on what you can spend on your hobby, there are only a handful of power tools I’d really call essential. Here they are. First of all, a corded power drill. You might have a perfectly good cordless power drill in your toolbox, and it’s true that you can get by perfectly fine with one of these. Sure, there’s a certain degree of convenience in a cordless drill being, well, cordless. However, when it comes to woodworking, a corded drill is the only way to go. They’re not only considerably cheaper than a cordless drill, but more powerful and versatile. There are many options when it comes to buying a corded drill, such as different chuck sizes and designs, straight or hammer drills, and other variations. You can learn more about these options, and check out reviews of some popular corded drill models at Popular Mechanics. The next big purchase on your list should be a compound miter saw. This is the ideal choice of mounted saw for the woodworker who doesn’t want to spend a fortune, but still wants a fairly competent workshop. It may not be as versatile or efficient as a full-sized table saw. However, it’s still extremely useful for cutting mitred, bevelled and combination cuts on the edges of a piece of stock. Getting the cuts exactly as you wanted them is going to be pretty tough when you first start using this particular piece of kit. 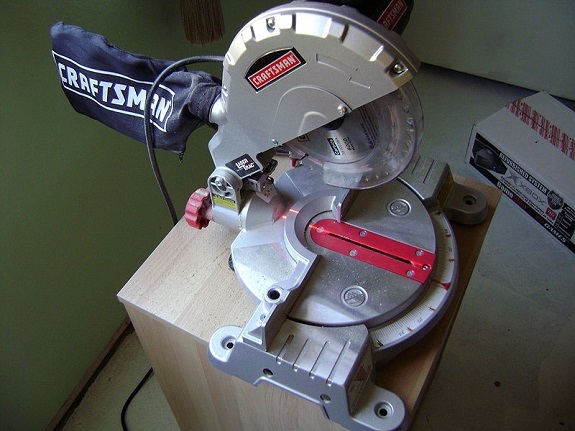 However, once you have enough practice and get your cuts right every time, you’ll never have to use a normal circular saw again. For more detail on miter saws, visit Straight Kerfs. Finally, we have one of the most important tools any woodworker can have in his shop: a random orbital sander. You may have a decent palm sander on the wall already, which will certainly do for a lot of woodworking projects. However, a random orbital sander uses hook and loop fastening disks, and doesn’t sand in patterns like other models. Instead, it uses a random motion, hence the name. A sander that operates with random patterns may sound a little unruly. However, this is where its key advantage lies. Thanks to this motion, you’ll be much less likely to leave unsightly sanding marks on your projects. Just make sure you’ll have access to the sanding disks and the different grits you’re going to want to use. You’ll have a great selection from most good woodworking shops. However, they can be a little harder to track down than the parts for a conventional sander. Before you start ordering heaps of raw lumber, be sure to get your hands on these important tools. I definitely agree with you on these necessary tools. Great information! Yeah! Great Post! Thanks for mentioning essential power tools for woodworker. In my opinion, a impact driver is also an necessary power tool for a wood worker. I has come handy for me in many situation.